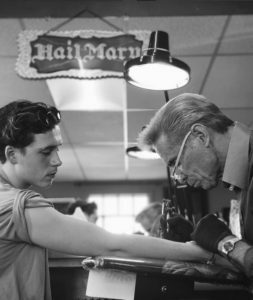 Brooklyn Beckham has been saying for years that he plans to get inked, just like his heavily-tattooed father, and over the weekend, the 18-year-old went under the needle for his first-ever tattoo, choosing a design that matches one of David Beckham’s pieces. 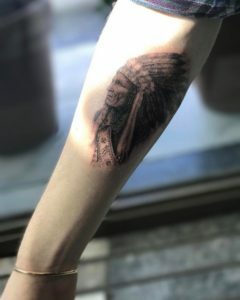 Brooklyn Beckham’s new tattoo features a black and gray image of a Native American chief wearing a full headdress on the inside of his forearm, done by David Beckham’s favorite tattoo artist, Mark Mahoney of the Shamrock Social Club tattoo shop in West Hollywood, California. David and Brooklyn are obviously very close, and now they have matching tattoos celebrating their father-son bond. According to reports, David Beckham accompanied his eldest son to the tattoo shop last weekend, and to celebrate turning 18 in March, Brooklyn got his first tattoo, courtesy of “my dads friend Mark Mahoney,” the teen wrote on Instagram. Brooklyn shared a series of photos of the tattoo session in progress on social media, captioning one of the snaps, “Thank you so much Mark x just like dads,” and then posted a couple of up-close photos of the finished product, which is very similar to the tattoo David Beckham had Mark Mahoney ink on his left side, just below his armpit, a couple of years ago. 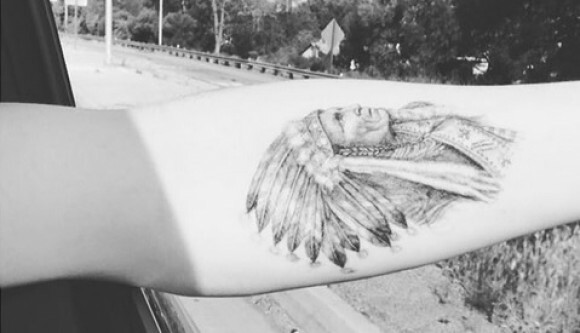 Coincidentally, pop star Justin Bieber also has a Native American chief tattoo located on the back of his left shoulder. 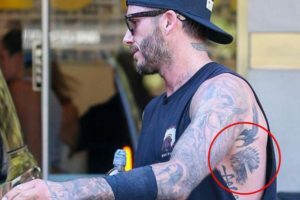 It’s also worth noting that David Beckham has a matching ship tattoo with his own father. It appears getting matching tats is a Beckham family tradition!